The work place kitchen’s of old had an often well-earned reputation for neglect and often misuse. A communal fridge, perhaps a small appliance or two, all in a space that doubled up as an extra storage room for supplies. Most of us can remember one or two, and all of us can remember how they made us feel. Yet as any estate agent will testify, when selling a property to a potential client, then usually sooner rather than later the subject of the kitchen will arise and with very good reason; People want to live in a home with a kitchen they’ll love, a well designed space that suits their needs and a place they will enjoy spending time in, entertaining, creating and simply enjoying the good things life has to offer. What is true of the home is equally true of the place we work and more and more organisations are waking up to the fact that a work place kitchen renaissance is under way. Gone are those dingy corners of old, replaced by something far better and from a business point of view; infinitely more productive! 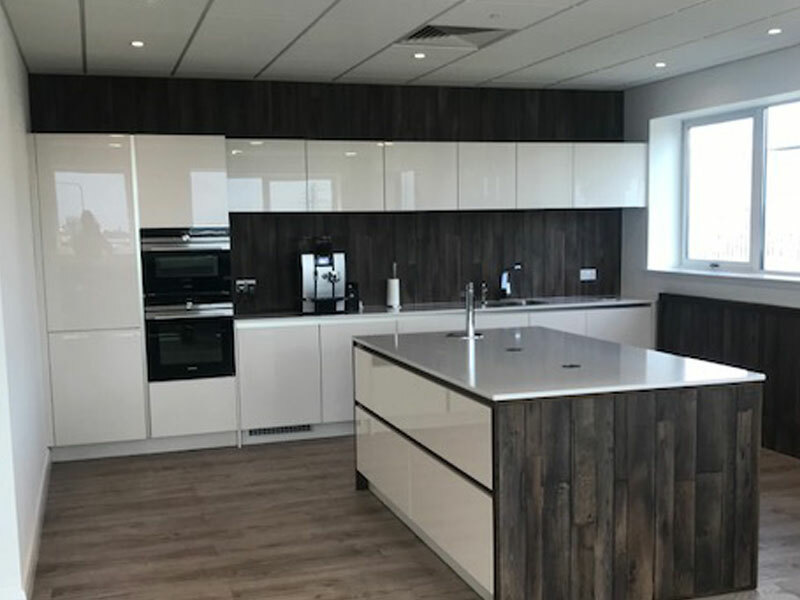 The work place kitchen of today has the potential to become an essential part of the office, a place to meet, collaborate, share ideas and engage with colleagues. A place where people come together and where ideas are as varied as the cuisine; A relaxing space where people from different parts of the business come together, instead of heading out to the nearest supermarket or cafe. In a well designed work place kitchen morale is boosted, well-being is enhanced and people are more connected, it’s positive for them, and positive for the business in which they work. What kind of kitchen your work place could accommodate depends of course on many factors and a design specialist such as Mihaus has both the experience and skill to transform your kitchen into the hub of your business, just as the domestic kitchen is the hub of your home. You may want an open plan kitchen; a place to hold impromptu staff meetings and relaxed working lunches. You might want a kitchen with hobs and ovens to create hearty meals for colleagues for memorable and unique team building and bonding, or just a perfectly designed, home-inspired space, where people can close the door and switch off for a coffee or lunch leaving their roles and responsibilities at the desk. The choice is yours but the potential is there to promote your employees well-being, host meetings and bring colleagues together, or just to provide an inspiring, energising space to enjoy food. The kitchens of today’s workplace have the potential to do it all.